Braves hurler Mike Foltynewiz kept the Phillies bats relatively silent for seven innings, but the top of the lineup jumped on Atlanta's bullpen in the eighth with three consecutive home runs en route to a 5-2 victory Sunday afternoon at Citizens Bank Park. Evened at one, Michael Saunders opened the eighth with a pinch-hit double to right. 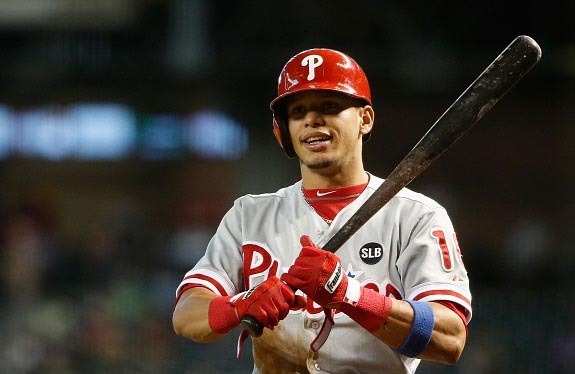 Cesar Hernandez followed, depositing a Arodys Vizcaino slider into the seats in right center to give the Phillies a two-run lead. "I told him to hit the ball up the middle," Phillies manager Pete Mackanin said afterwards. "He did a little more than that and it turned out well for us." Following Hernandez, Aaron Altherr and Odubel Herrera proceeded to launch solo shots of their own, providing insurance for the Phillies' bullpen. On the mound, Zach Eflin was dominant. He pitched seven innings, surrendering one run while scattering just three hits. He struck out three and didn't allow a baserunner to reach second until two outs in the sixth inning. The win secured the Phillies first sweep since September 20-21, 2016 when the club took a two-game series from the Chicago White Sox. The last three-game sweep came August 12-14, 2016 against the Colorado Rockies. Prior to Sunday the Phillies had hit three consecutive home runs just seven times in franchise history, most recently on June 13, 2008 in St. Louis when Chase Utley, Ryan Howard, and Pat Burrell all went yard. Hernandez has reached base safely in 16 of his 18 games this season and has hit safely in 15. Also of note, he hit his fourth homer of the year today in his 85th plate appearance of the season. He didn't hit the four homer mark last year until his 450th plate appearance. The Phillies have an off day on Monday before welcoming the Miami Marlins for a four-game set beginning Tuesday. Vince Velasquez (0-2, 7.20) is scheduled to pitch for the Phillies, opposing left-hander Wei-Yin Chen (2-0, 3.94).